You might have observed high resolution wallpapers displayed in the background of Bing.com homepage. These wallpapers frequently change and if you have liked particular wallpaper there is no option to download the wallpaper to the desktop. Here is software known as Bing4Free that will help you to download the wallpapers displayed in bing.com. 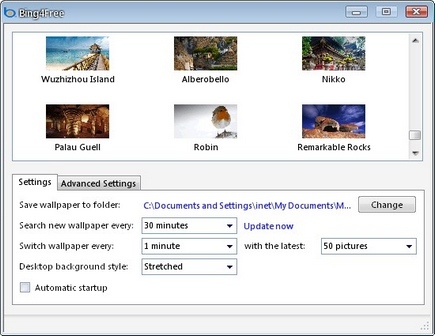 This application has option to schedule the download of wallpapers at particular minutes or on hourly basis. Bing4Free is also a wallpaper changer that can automatically change your desktop wallpaper every minute or on hourly basis.